A delegation of party members has met with the Venezuelan Ambassador to the UK and Ireland, Rocío Maneiro, to convey the Party’s solidarity with the Venezuelan government and its peoples and to voice our condemnation of the US sponsored attempted coup and the ongoing attacks against the democratically-elected government of Nicolás Maduro. The Ambassador outlined the current situation in Venezuela and the great dangers not only for Venezuela, but also the entire region, when long established principles of international law on non-interference and territorial sovereignty were being set aside. 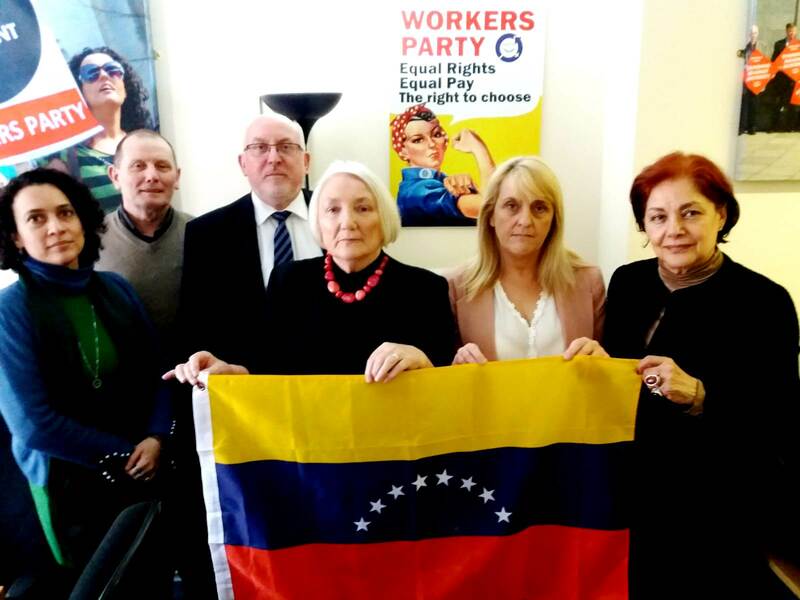 In welcoming the Ambassador and her colleague to Belfast the Party’s International Secretary, Gerry Grainger, expressed the Workers Party condemnation of the escalation in aggression against Venezuela. The Workers Party is calling for an immediate end to the interference and aggression against the Bolivarian Republic of Venezuela, for respect for its sovereignty and independence and is appealing for International solidarity with the Bolivarian Revolution and the Venezuelan people. Union – called for the cancellation of the election. Following the election which strengthened President Maduro’s position, the fourteen member nations of the Lima Group recalled their ambassadors from Venezuela. Republic Movement and later the United Socialist Party of Venezuela (PSUV). The Bolivarian Revolution is named after Simón Bolívar, the early 19th-century Venezuelan and Latin American revolutionary leader, prominent in the Spanish American wars of independence in achieving the independence of most of northern South America from Spanish rule. International Women’s Day remains an important date in the political calendar – not just because the struggles for equal rights, for equal pay and for the right to control reproductive choices still need to be fought, but because there is a lobby, made up mostly of the middle classes, that pretends that ‘women have never had it so good and we can all stop agitating now’. Now more than ever those vicious myths need to be exposed, now more than ever those who want to pull the ladder up behind them need to be challenged. demand free, safe and legal abortion for all, not just the few, why we will campaign against the ruthlessness of zero hours contracts, the exploitative nature of much part time employment and why we will continue to struggle for full participation by women in all aspects of political, social, economic and cultural life . That is why we continue to hold International Women’s Day to be an important date and an important event. The Workers Party is opposed to direct rule and has consistently called for the restoration of the Assembly and the Executive. “However, the refusal of Sinn Fein and the DUP to form an administration means that the only viable option available is for Westminster to legislate for abortion services for Northern Ireland. “The DUP and Sinn Fein continue to inflict a great disservice on local politics and the people of Northern Ireland. “The human rights, health, well-being and choices of local women don’t even feature in their diversionary and on-going discussions. “While local politicians choose to ignore it , Westminster must now acknowledge and respond to the suffering and plight of women in Northern Ireland who seek to have an abortion. This doesn’t happen on the Malone Road or Holywood Co. Down: we can’t ignore that. Workers Party representative Joanne Lowry has condemned recent ‘death-riding’ incidents in the Lower Falls area. “The damage, misery and grief inflicted on the community by these types of incidents cannot and should not be underestimated”, Joanne said. “Two recent events, in particular, – in Ross Road last week and in the early hours of Monday morning on the Grosvernor Road – have brought media and wider public attention to this problem , but it is an on-going and almost daily reality for many areas throughout West Belfast, with often serious and sometimes fatal consequences”, she said. “It would be great to be able to say that there is an easy, quick and permanent solution to car theft, ‘death riding’ and all the destruction and misery that it brings. But there is not”. “That doesn’t mean that we should do nothing and I know of some very positive work being undertaken by groups and individuals in this area to overcome these problems”. Socially deprived areas Joanne pointed out that this level of destruction does not happen right across Belfast. “Historically it occurs in socially deprived areas with high unemployment, where many young people have few if any qualifications, low aspirations and low self-esteem. Those factors are often further compounded by substance abuse”, she explained. “Death riding and other anti-social activity is a direct result of living in some of the areas in West Belfast. This doesn’t happen on the Malone Road or Holywood Co. Down: we can’t ignore that. The roots of the problems are located in the social and economic conditions of these areas and some, but of course not all, young males, in particular, who feel they have no worth and no way out react as they do”, she said. “What we must tackle are the causes of their behaviour and our local elected representatives have questions to answer. What investment, opportunity and hope have they brought to west Belfast and to the Lower Fall area in particular? Many will be queuing up to condemn these incidents – and rightly so – but what can they say that they have done to materially change conditions in these areas? I think the answer is very little”. The Workers Party’s annual conference in Northern Ireland has heard how the power of a united working class can tackle and overcome the collapse of the Assembly, the problems faced in health and social care, education women’s rights and the environment, eradicate sectarianism and rebuild the economy. The Economy There are a number f myths about the Northern Ireland economy, chief among these are the ideas that a freely competitive capitalist economy, left to itself generates full employment. Secondly that there is a tendency in developed capitalist economies towards a decrease in inequality, due to the effects of modernisation, including enhanced educational opportunities. So, the idea is that capitalism generates equality. Both suggestions are myths. Health and Social Care A universal health service is fundamental to an equal, inclusive, just and fair society and is one of the corner stones of the Welfare State. Bevin, in his book In place of Fear, said there will always be a National Health Service as long as there are people willing to fight for it. The Workers Party is willing to lead that fight! There must be increased funding and resources for mental health services in Northern Ireland. The prevalence of mental ill-health here is higher than anywhere else in the UK while funding per capita remain the lowest. Childcare in Northern Ireland must be a responsibility taken on by the state for the benefit of all its citizens. Centrally planned and resourced facilities, free at the point of delivery should be the norm. Sectarianism Sectarianism is more widespread, more ingrained, more accepted now, than at any time over the past 50 years. That’s not a claim to be made lightly. We now live with a culture in which sectarianism is formally institutionalised. A culture in which manifestations of sectarianism are no longer seen as sectarian. We live in a culture in which it is deemed acceptable to think, speak and act in a sectarian manner but without rebuke, reproach or criticism – that is the extent to which it has become embedded in our psyche and in our culture. That’s what sustains the myth of two communities that is what drives and maintains artificial divisions. Environment Plans by Dalridian Gold to mine the Sperrins – an officially designated area of outstanding natural beauty – and the granting of exploration licences by the Department for the Economy were strongly criticised. When the Workers Party was invited to sign the recent letter from civic unionism we declined because we do not subscribe to the notion of ‘two communities’ or the establishment of a society based on competing versions of nationalism, whether Irish or British. Nor did we support the open letter signed by ‘civic nationalists’ last December – in fact we were extremely critical of it ( see link below). Polarise and paralyse This most recent letter from civic unionism does not move the debate on any further, It does not challenge or distance itself from the ‘separate but equal’ mantra which continues to polarise and paralyse our society. In fact. albeit that many of the signatories would be sympathetic to a non-sectarian and more democratic society, pitching ‘civic unionism’ against ‘civic nationalism’ compounds and confirms the existing problems. Bill of Rights Our version of a democratic secular society in Northern Ireland is based on the rights of citizens as citizens rather than their allegiance to any religious or nationalist bloc. It is for that reason that the demand for a Bill of Rights remains a fundamental part of our strategy to establish and guarantee the relationship between citizens and the state, guaranteeing the civil liberties of all citizens, regardless of communal background. Citizenship The demand for equality and democratic rights is not the property or the preserve of any bloc. It’s ownership should rest firmly with citizens as citizens. Only on that basis will progress be made and citizenship flourish.